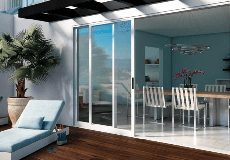 Andy’s Glass & Window Company of Temecula Valley has been servicing the glass, window and door needs of Southern California since the 1970′s. Andy’s Glass, Window and Door is the largest contractor for glass around. Our professional window and glass installers offer quality service and skilled craftsmanship that is second to none. At Andy’s Glass, Window and Door Company we strive to build and maintain a strong, consistent, reputation of quality and service with our clientele. From New Construction to Retrofit / Replacement windows and doors, we will guide you in the right direction to match your needs with your budget, never compromising quality. Our Window installers are AAMA Certified, assuring nothing less than superior workmanship. We are a Certified Milgard® Dealer and 5 time winner of their prestigious “Milgard Dealer of the Month Award”. Andy's Glass & Window Company is rated 4.9 out of 5 by 53. Rated 4 out of 5 by Bearcub from Glad I asked the question Had Andy’s come out to measure our sliding glass doorway. During the appointments conversation I discussed long term ideas where the sliding door would be replaced. I asked about a track replacement as I didn’t want to spend unnecessarily as I was looking to re design. He matched up the track to original specifications and it was installed in about 10 days. Glad I asked. Rated 5 out of 5 by fade67 from Great service and communication Replaced 3 windows in my daughters bedroom. They delivered exactly when they said, they arrived exactly when they said and the job went perfectly. Smooth all around. Miguel and Anthony were professional and great. Rated 5 out of 5 by Russo from great service The service, delivery, installation and clean up provided by the technicians was just OUTSTANDING!!!!!! I was very satisfied with their professionalism. I will definitely contract their services if I ever need them again. Rated 5 out of 5 by Rourke08 from Great Work Came to replace a Milgard window that I had ordered with them. The tech turned up on time, polite, professional and was in and out in about 30mins. Window looks great! Rated 5 out of 5 by JoshV from Prompt and Courteous! We hired Andy's Glass to install our retrofit windows and doors. The installers that came out to the house were professional, detail oriented,knowledgeable and friendly. They showed up on time both days that they were here, and were patient with our two dogs. Everyone that we spoke with in the office was also extremely helpful and courteous.